Muslim Americans appear to be highly assimilated into American society and they are largely content with their lives. More than six-in-ten do not see a conflict between being a devout Muslim and living in a modern society, and a similar number say that most Muslims coming to the U.S. today want to adopt an American way of life rather than remain distinctive from the larger society. A majority of Muslim Americans (56%) say that most Muslims coming to the U.S. today want to adopt American customs and ways of life. Far fewer (20%) say that most Muslims coming to the U.S. want to be distinct from the larger American society, with a similar number (16%) volunteering that Muslim immigrants want to do both. Native-born and foreign-born Muslims give similar answers to this question. 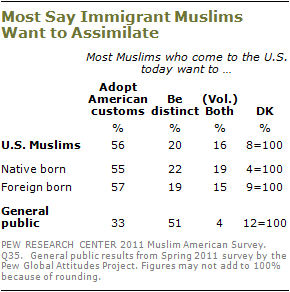 The U.S. public as a whole is less convinced that immigrant Muslims seek to assimilate. An April 2011 Pew Research survey finds that just a third of American adults (33%) think that most Muslim immigrants want to adopt American ways, while about half (51%) think that Muslim immigrants mostly want to remain distinct from the larger culture. When asked whether they think of themselves first as an American or first as a Muslim, about half of Muslims (49%) say they think of themselves first as a Muslim, compared with 26% who think of themselves first as American. Nearly one-in-five (18%) volunteer that they think of themselves as both Muslim and American. A May survey by the Pew Global Attitudes Project finds that 46% of Christians in the United States think of themselves first as a Christian, while the same percentage says they consider themselves first as an American. Among both Muslims and Christians, people who say religion is very important in their lives are far more likely to view themselves primarily as a member of their religion. Among Muslims who say that religion is very important in their lives, 59% say they think of themselves first as Muslims. 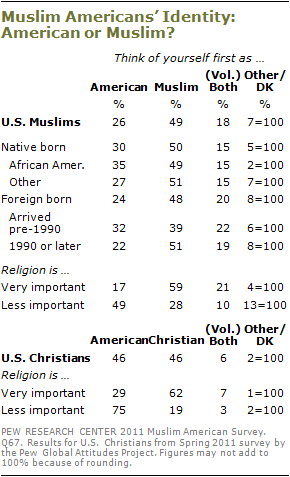 Among those for whom religion is less important, only 28% identify first as Muslim. Similarly, among Christians who place great personal importance on religion, 62% say they are Christians first, compared with 19% among those who view religion as less important. Pew Global Attitudes Project surveys conducted this year found substantial differences in views of national identity across Muslim publics. Nearly all Pakistanis (94%) consider themselves first as Muslims rather than as Pakistanis. By contrast, just 28% of Muslims in Lebanon say they consider themselves Muslim first – far fewer than the number of U.S. Muslims expressing this view (49%). Many Muslims report having friendship networks that extend beyond the Muslim community. About half of U.S. Muslims say that all (7%) or most (41%) of their close friends are Muslim; about as many say that some (36%), hardly any (14%) or none (1%) of their close friends are Muslim. More women than men have a close circle of friends consisting mostly or entirely of other Muslims. 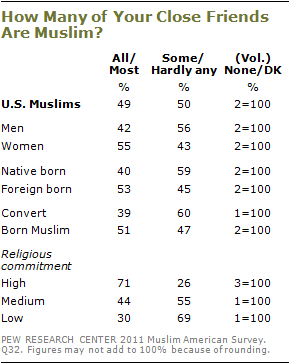 And Muslim Americans who are highly committed to their religion are much more likely than those with medium or low commitment to say that all or most of their close friends are Muslims. More than six-in-ten American Muslims (63%) see no conflict between being a devout Muslim and living in a modern society, twice the number who do see such a conflict (31%). A 2006 Pew Research survey found a nearly identical pattern among American Christians who were asked about a possible conflict between modernity and their own faith. Nearly two-thirds of Christians (64%) said there is no conflict between being a devout Christian and living in a modern society, compared with 31% who did perceive a conflict. Muslims of all ages express similar views on this question. Similarly, there are only small differences between native-born Muslims and immigrants, as well as between those who are personally religiously observant and those who are less religious. There are, however, sizable differences between men and women in views on this question. More than seven-in-ten men (71%) say there is no conflict between Islam and modernity, but fewer women (54%) agree. The view that there is no conflict between Islam and modernity is also much more common among college graduates than among those with less education. More than eight-in-ten Muslim Americans (82%) say they are satisfied with the way things are going in their lives, while only 15% are dissatisfied. By this measure, Muslims express slightly higher levels of satisfaction with their lives than does the U.S. public overall (75% satisfied, 23% dissatisfied). The survey finds high levels of life satisfaction across a wide variety of demographic groups. Among both men and women, for example, roughly eight-in-ten express satisfaction with the way things are going in their lives. And this sentiment is expressed by roughly comparable numbers of native-born (79%) and foreign-born Muslims (84%). Among native-born Muslims, second-generation Americans (those whose parents were born outside the U.S.) express higher levels of satisfaction with their lives (90%) than third-generation respondents (71%). More than three-quarters of U.S. Muslims (79%) rate their community as an excellent (36%) or good (43%) place to live, mirroring the level of community satisfaction seen among the U.S. population overall (83%). This high level of satisfaction with their communities is also seen across a wide variety of demographic subgroups. Even among Muslims who report living in a community where there has been an act of vandalism against a mosque or a controversy over the building of an Islamic center, 76% rate their community as a good place to live. Satisfaction with their community is especially high among immigrants (83%) and second-generation Muslims (86%). Among third-generation Muslims, somewhat fewer, though still a majority (61%), rate their community as an excellent or good place to live. In addition to their high levels of satisfaction with their own lives and their communities, most U.S. Muslims (56%) are satisfied with the direction of the country. This is starkly different than in 2007, when 38% expressed satisfaction with the way things were going in the country and 54% were dissatisfied. While Muslims have become more content with the country’s direction over the past four years, the public as a whole has moved in the opposite direction; about a third of American adults (32%) were satisfied with the way things were going in the U.S. in 2007, compared with 23% expressing satisfaction earlier this summer. Analysis of the survey suggests that Muslims’ increased level of satisfaction with the direction of the country is linked with the election of Obama, who receives overwhelmingly high approval ratings from Muslim Americans (76% of U.S. Muslims approve of Obama’s job performance, compared with 46% of the public overall). Among the three-quarters of Muslims who approve of Obama’s handling of his job, 61% are satisfied with the direction of the country. By contrast, among the quarter of Muslims who do not approve of Obama’s performance, just 41% are satisfied with the direction of the country. The survey also shows that the greatest increases in satisfaction with the direction of the country have occurred among native-born, African American Muslims. In 2007, just 14% of this group were satisfied with the way things were going in the country. Today, 46% express satisfaction, more than a three-fold increase. This 32-point increase in satisfaction with the country’s direction is nearly twice as large as the 18-point increase observed among Muslims overall. Nearly half of Muslim Americans (46%) say they are in excellent or good shape financially, while 53% rate their financial circumstances as fair or poor. These figures are similar to those from 2007, when 42% of Muslims said they were in excellent or good financial condition and 52% were in fair or poor shape. By contrast, the public overall is more negative in their evaluations of their financial situation than in 2007, and Muslims now rate their financial situation somewhat more positively than the public overall. Not surprisingly, Muslims who have graduated from college are more satisfied with their financial condition (64% in excellent or good shape) compared with those who have some college education (46% excellent/good) and those who have a high school degree or less education (37% excellent/good). Immigrants are more satisfied with their financial situation than are native-born Muslims. Nearly three-quarters of U.S. Muslims (74%) continue to express faith in the American dream, saying that most people who want to get ahead can make it if they are willing to work hard. One-in-four Muslims (26%) take the opposite point of view, that hard work and determination are no guarantee of success for most people. Muslims endorse the view that hard work will lead to success at higher rates than the American public overall, among whom 62% say most people can get ahead if they are willing to work hard. The belief that hard work pays off is broadly held among U.S. Muslims. Similarly large numbers of men and women, young people and older people, and immigrant and native born express this belief. Muslims participate in a variety of social and recreational activities at rates very similar to those seen among the U.S. population as a whole. Roughly six-in-ten Muslims (58%) regularly watch an hour or more of entertainment television programming in the evening, similar to the share of U.S. adults (62%) who say they same. 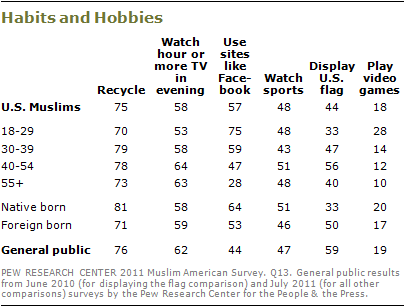 About half of both U.S. Muslims (48%) and Americans overall (47%) regularly watch professional or college sports. And about one-in-five Muslims (18%) regularly play video games, with a nearly identical share of the general population (19%) saying the same. Muslims report using online social networking sites such as Facebook or Twitter at rates higher than those seen among the general public. This is partly due to the high rate of use among younger Muslims (75% among those under 30) and because the Muslim population is younger than the U.S. population as a whole (36% of Muslims are under age 30, compared with 22% among the general population). Displaying the American flag at home, at the office or on the car is less common among Muslims (44%) than among the population as a whole (59%). Half of Muslim immigrants say they display the flag, compared with 33% of native-born Muslims overall and 35% of native-born African American Muslims. The percentage of Muslims who say they recycle paper, plastic or glass from home (75%) is nearly identical to the share of the total U.S. adult population that says the same (76%).